Colin Riordan became Vice Chancellor of Cardiff University in September 2012, having previously spent 5 years as Vice Chancellor of the University of Essex. 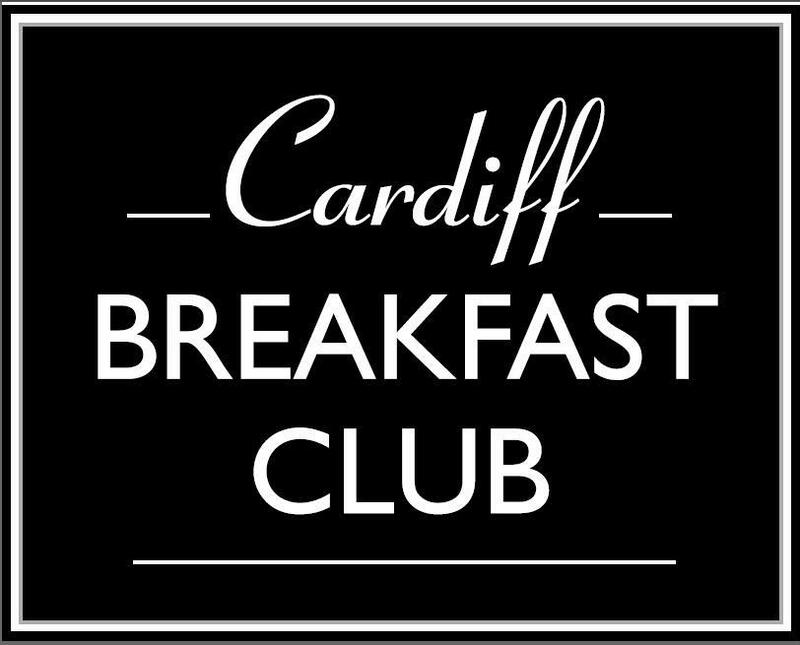 He outlined the University’s inspiring “vision for innovation” to the Cardiff Breakfast Club members this morning. With around 16,000 undergraduate students, Cardiff University is “an important cog in the region’s economy”. Colin is very aware of the University’s role in and obligation towards the future prosperity of Wales. He called the University an “engine of prosperity for Wales”, and discussed how he intends to closely examine just how it can turn its intellectual and physical assets into economic growth, and improving the quality of life for people in Wales. To this end, the University recently published “The Way Forward”, a document outlining its strategy and “direction of travel” for the future. This includes an ambition to rank consistently among the world’s Top 100 universities, and in the Top 20 of The Times’ influential university league table. Colin Riordan, the Vice-Chancellor of Cardiff University, outlined the institution’s “vision for innovation”. Key to this will be the Cardiff Innovation System, a combination of physical and academic resources that will “change the way we do everything” at the University. All the University’s schools and disciplines will work together in a self-sustaining system to feed what Colin called “translational research”: bringing academic research activity into the commercial sector. For example, the business school can provide valuable models and entrepreneurial advice, while the social sciences can examine social acceptance of technologies and undertake “horizon scanning” to suggest the most promising areas for research in the future. The Innovation System will need physical space, with lab facilities that are available to both commercial and academic researchers. These will have shared social spaces to encourage collaboration and interaction. Colin called these “Serendipity Spaces”, environments conducive to creativity where people from all disciplines can mingle and “spark something”. This will all be underpinned by close student involvement, to educate the next generation of entrepreneurial innovators. Colin wants students to be as much “innovation natives” as they are “digital natives”; viewing entrepreneurship as a normal part of life. This, combined with leading research expertise and a ready supply of highly qualified graduates will work as a magnet for inward investment, raising the profile of Wales internationally and giving Wales a “reputation for innovation”. Many of the ideas Colin discussed are still at “a conceptual stage”, and he warmly encouraged Breakfast Club members to actively engage with the University, praising the mutual benefits of strong private-sector relationships. This morning we were joined by Julie Lydon, Vice Chancellor of the University of Glamorgan, who discussed the vital importance of the Higher Education sector to Wales’ economy, as well as the impact of recent “seismic shifts” in the market on students, employers and institutions. Having been a graduate, lecturer, and on the senior management team at two previous institutions, Julie is exceptionally experienced on “both sides of the business-university fence”. Higher Education (HE) is a major employer across the UK, and the University of Glamorgan is no exception; encompassing 2500 staff over 6 sites, the institution has a turnover of £150million. Yet the economic impact of the HE sector reaches further than this. Julie stated that for every £1 of funding from the Government, Welsh students contribute £5.60. While Julie was keen to stress that universities are not businesses, with this in mind, they must run “in a businesslike way”. The University of Glamorgan’s acute understanding of the business world is indeed one of its strongest selling points. Founded in 1913 (and celebrating its centenary next year), combining academic excellence with understanding the needs of employers is “part of its DNA”. Successful universities need to work with employers and provide the courses that they are looking for. However, a degree is “only part of making an employee”. Work experience was one of the university’s founding principles, and remains “vital”. For students unable to partake in industry placements, the Glam Edge programme and investment in the “student experience” as a whole encourage Glamorgan graduates to develop the skills and awareness to succeed in their chosen industries. And they are succeeding: 93% of Glamorgan graduates are in employment or further study after 6 months, the highest rate of any Welsh university. However, Julie is aware of the fundamental changes to the sector, and the need for institutions to adapt and grow accordingly. The changes in tuition fees led to an expected reduction in applications, with 54,000 fewer students entering HE across the UK, costing the sector an estimated £1billion. While nobody currently knows if this is a “blip”, Julie is confident that it is at least a trend. With this in mind, Wales’ HE institutions need to “stop looking inwards”, and consider how they can compete on a national and international stage. Next year Glamorgan takes a bold step towards this by merging with the University of Wales, Newport. Partnering a Russell Group, research-minded university with an employability-focused university is a “powerful pitch”, which will help the new institution “take on the big players” in metropolitan regions across the UK. More than this, it will enable traditionally “underserviced” regions in both the heart of Cardiff and across the Valleys to access HE and the benefits it brings. In a climate that often asks “what the point of going to university is” these days, Julie’s discussion and inspiring examples underscored that there are always more opportunities for those with degrees than those without. Unlocking this potential benefits not the individual, their future employers, and undoubtedly Wales’ economy too.